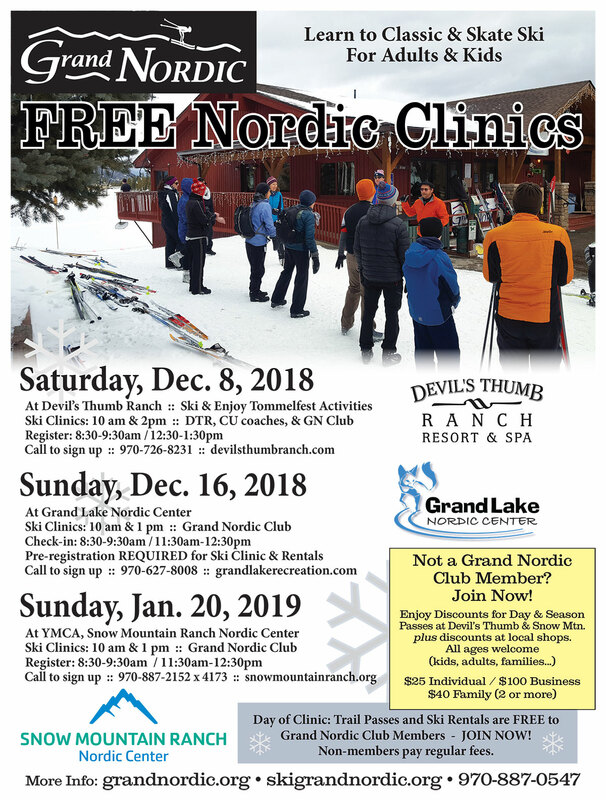 Free Nordic ski clinics for all levels, adults and kids. The first free clinic will be Saturday, December 8th at Devil’s Thumb Ranch at 10am and 2pm. A second free clinic will be offered Saturday, December 16th at Grand Lake Nordic Center at 10am and 1pm. The final free clinic will be offered Sunday, January 20th at YMCS, Snow Mountain Ranch Nordic Center at 10am and 1pm. Please pre-register for each clinic. Click here for more information, including how to register. Can’t wait for snow? Neither can we! That’s why Snow Mountain Ranch is hosting two Nordic community gatherings this fall. The first gathering was held at Snow Mountain Ranch Nordic Center on Saturday, October 27th from 1-3pm. The second gathering will be at Boulder Cycle Sport (Boulder Nordic Sport) on Saturday, November 3rd from 1-3pm. Nordic Director Bill pierce will lead a dry-land exercise to get you cross-country ready and give you the skinny on the winter event calendar and what’s new for 2018-2019. 2-3pm: Join us for light appetizers and refreshments while we give updates about upcoming Snow Mountain Ranch events and programs. Enter to win a free annual membership or cabin stay. Everyone is welcome! The Snow Mountain Ranch Nordic Center will open for the 2018-2019 season on Saturday, November 17th. Snow Mountain Ranch’s Nordic Center has more than 120 kilometers of world-class terrain for Nordic skiing, snowshoeing and fat biking in the Colorado Rockies for everyone from first-time recreational participants to elite racers. For more details, visit snowmountainranch.org.